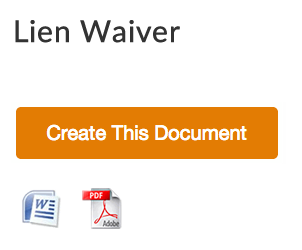 To download the free lien waiver form in PDF format, please go to Free Lien Waiver page and download Free Lien Waiver form in a PDF format. There are 4 types of lien waivers - Conditional Lien Waiver, Unconditional Lien Waiver, Conditional Lien Waiver on final payment,Unconditional Lien Waiver on final payment. Can Lien Waivers protect you against contractors/subcontractors?